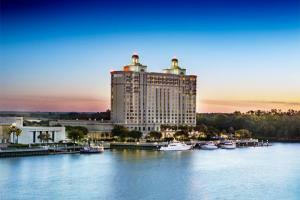 See trendy, metropolitan Atlanta or step back in time on the streets of Savannah - Southern charm and warm nights attract visitors from around the world to Georgia. These affordable Georgia vacations are perfect for families. Downtown Savannah Our 2.5-Star classification designates those properties offering comfortable accommodations with standard amenities. 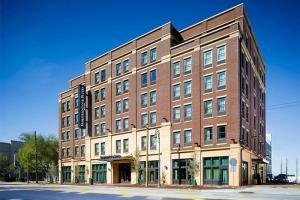 Guests can expect dependable services in a clean and comfortable environment. Half star indicates that the hotel/resort meets all criteria of the designated rating and exceeds in certain areas. 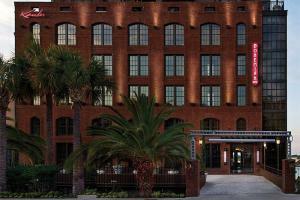 Savannah Riverfront Our 4-Star classification designates those properties with well-appointed, deluxe accommodations, extensive amenities and comprehensive guest services. Expect attention to detail and a warm and hospitable staff ready to cater to your needs. These superb properties offer a truly refined getaway. 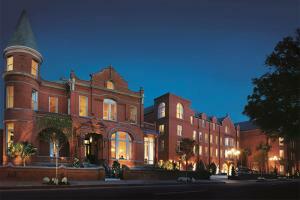 This captivating riverfront hotel is steps from Savannah's most popular attractions. Forsyth Park Our 4.5-Star classification designates those properties with well-appointed, deluxe accommodations, extensive amenities and comprehensive guest services. Expect attention to detail and a warm and hospitable staff ready to cater to your needs. These superb properties offer a truly refined getaway. Half star indicates that the hotel/resort meets all criteria of the designated rating and exceeds in certain areas. Historic charm, glamorous design, impeccable service and a stunning art collection create an unparalleled, unforgettable experience at this luxurious hotel. Historic Savannah River Dist. Our 4-Star classification designates those properties with well-appointed, deluxe accommodations, extensive amenities and comprehensive guest services. Expect attention to detail and a warm and hospitable staff ready to cater to your needs. These superb properties offer a truly refined getaway. It is the South’s only downtown resort. Unique amenities include secluded beach access, an automotive Road Course, and boat dock privileges.